Or, scikit-learn’s importance weighting in CV is broken. If the title doesn’t immediately give you chills, it should. Allow me to explain. Defining what is meant by comparator is important. By comparator, I mean a total ordering on a set. Different programming languages call this binary relation by different names: Java calls it a Comparator, Scala an Ordering, Haskell calls it Ord and python admits a key function to establish order. Hopefully, the utility of such a comparison function is apparent. It establishes order on the elements of a set of objects. It enables operations like sorting, min and max. But what happens if there’s a bug in this comparison function? Since its implementation is decoupled from the functions utilizing it, the correctness of the comparison function is independent of the algorithms (like sort, min and max) utilizing it. Even though the sort, min or max algorithms may be correct, using a buggy comparison function may give undesirable and wildly inaccurate results. This should not be surprising, but it should nonetheless be noted. scikit-learn optimizes algorithm hyper-parameters during cross validation without considering importance weights in the metric computations used as a basis for comparing hyper-parameter configurations. Because models are trained with importance weights but not tested using importance weights, they are trained on a different distribution than the one used during validation. shows that different hyper-parameters can indeed be returned when importance weighting is considered during metric calculations in cross validation. During cross validation in scikit-learn, importance weighting is used in model training but not validation. We can start to see the problem take shape. When trying to address statistical issues like sampling bias, importance weighting can be used to unwind these biases introduced in the sampling process. This is predicated on the idea that importance weighting is consistently applied during training and validation. The fact that scikit-learn incorporates importance weights in training but not validation during cross validation means that models learn a distribution different than the one used to measure their efficacy. This is a manifestation of the same problem we sought to eliminate with importance weighting in the first place. See the rub? What is most consequential is that this problem appears inside the code that helps to sort (or rank) models in relation to their efficacy. To start to understand the issue more thoroughly, we’ll have to look at the definition of cross validation. This is very similar to the definition found in  with the addition of the parameters, . The inner summation (and normalizing constant) describes the average loss within a test fold and the outer summation describes averaging over the test folds. 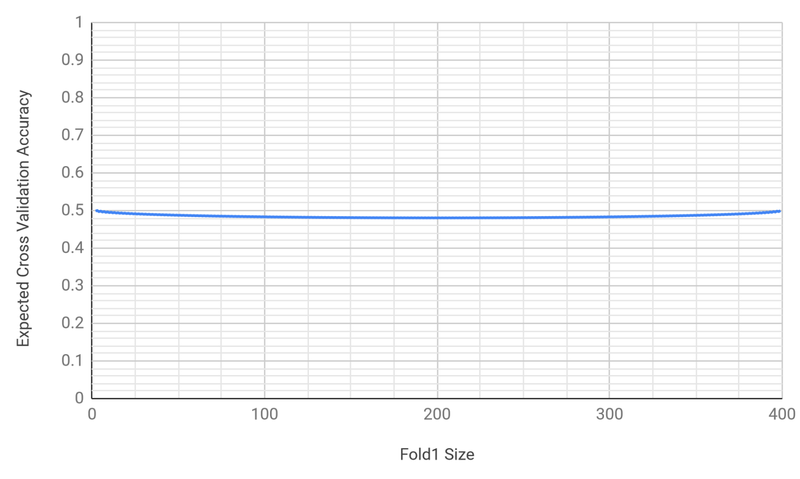 Notice that the average loss within a test fold is bounded by the minimum and maximum loss of any . Notice additionally that with this formulation, the average loss of each test fold has the same contribution in the outer summation, regardless of fold size. In the case that the scoring function is invariant to , then and are equivalent. To verify the behavior of importance weighted cross validation, I devised the following unit test. This unit test looks at a few different scoring functions and some different importance weight vectors, but there are always two folds and two examples per fold. The sample_weight vector is split into two folds, where the first two values represent the first fold and the second two values represent the second fold. The bold-faced values represent the weight associated with the single positive example in the fold and the non-bold faced values represent the weight associated with the single negative example in the fold. Since scikit-learn does not incorporate importance weights, the results are rather undesirable. For instance, the accuracy value is always 0.5 since it only correctly classifies one example per fold (but disregards importance). If instead of importance weights, the data was replicated the number of times indicated by the importance weights, then scikit-learn’s results would align with the desired importance weighted results if the size of the two folds are equal. If data replication rather than importance weighting was employed and scikit-learn used weighted averaging across folds on the relative test fold sizes rather than simple averaging, then scikit-learn’s results would align with the desired results. The need for weighted averaging can be seen when observing the behavior of leave-one-out cross validation. Since the scoring functions are invariant to the norm of the sample_weight vector, importance weighted cross validation cannot work without weighted averaging across folds. It would simply be regular unweighted leave-one-out cross validation. It is obvious from the Table 1, but it should be noted that the scikit-learn’s cross validation metrics can under or over predict the importance weighted estimate, sometimes rather dramatically. If the sample_weight vector were instead , the accuracy estimate becomes 0.2525. To bolster the claim that weighted averaging offers better estimates than simple averaging when combining the within-fold estimates, we can calculate the expected accuracy when there is a population of 400 examples with 201 positive examples. Using 201 positives of 400 examples and allowing the examples to fall into any fold allows us to calculate the expected accuracy over all possible fold combinations. This can be calculated using the hypergeometric distribution. See  for details. The expected accuracy results in the following graph where accuracy varies with the fold sizes. which is directionally incorrect versus 0.2525 in relation to the above interval. This issue has bean present in scikit-learn since 2015. Multiple open tickets have been on GitHub since April 2015. Issue 4632 (April 24, 2015) asks “should cross-validation scoring take sample-weights into account?” Issue 4497 (April 2, 2015) is concerned with API consistency and naming issues. What, in my opinion, is so appalling about this is that these issues have been open for nearly four years! It seems that these tickets have been bogged down in naming conventions and API consistency and meanwhile, this issue has silently crept into many codebases. scikit-learn has very wide adoption. The testimonials page lists leading financial institutions as well as prominent tech companies as adopters. Now, let me pose the question: if you are investing money with a financial institution that uses scikit-learn for financial modeling, would you not want hyper-parameter search to use the training distribution as the basis for selecting hyper-parameters in those financial models? if you have ever complained about music recommendation algorithms, would you not want a company invested in making music recommendations to use the same distribution for training and model validation? This is the scope of this problem. It is a big problem! Arguments about naming conventions are not an appropriate excuse for letting this issue fall through the cracks. The biggest problem that I see is that this issue has for years been a known problem (and there have been pull requests to attempt to fix this), but people have been so apathetic that these fixes solutions have not really been considered. See the GitHub issues listed above for more context. Meanwhile, there is no indication that the problem is actually occurring, save scrutinizing the results. No warnings are emitted, no errors raised or exceptions thrown: nothing. On a personal note, it took me over an hour and a half of pair programming and debugging into the scikit-learn code in order to convince one of my colleagues that this issue existed at all. The reason it was so difficult to convince him was that he was incredulous due to the fact that he had previously used importance weighted cross validation in scikit-learn. Since the cross validation code did not result in any kind of error, he was oblivious to problem and had no reason to question the validity of the results. This is exactly the danger I am trying to warn against here: a problem arising due to our willingness to implicitly trust testing and validation code. I fixed this issue in internal forks but this issue deserves real consideration. This problem needs to be addressed with the gravity it is due. I have created pull requests for both scikit-learn (https://github.com/scikit-learn/scikit-learn/pull/13432) and a distributed version for dask (https://github.com/dask/dask-ml/pull/481) in the hope that this will benefit others. I created this post to point out the problem and its gravity along with a viable fix. Please give this issue the importance it deserves. There may be nothing especially novel in this article. There are no proofs of correctness, merely evidence in the form of tests supporting the existence of flaws in the cross validation routines in scikit-learn. The above code is released under the MIT License, Copyright (c) 2019 Ryan Deak. Sugiyama, Masashi, Matthias Krauledat, and Klaus-Robert Muller. “Covariate shift adaptation by importance weighted cross validation.” Journal of Machine Learning Research 8. May (2007): 985-1005. Deak, Ryan. “sklearn_scorer_wt_invariant.py” Gist, https://gist.github.com/deaktator/94545f807f139eba2c8a15381f2495e0. Accessed 5 Mar. 2019. Deak, Ryan. “hypergeom_sklearn_imp_wt.py” Gist, https://gist.github.com/deaktator/1080eca4c291070d009014f2f2d759ad Accessed 5 Mar. 2019.